Socrates was the first great philosopher of the West. Though he left no written works, there were many accounts of his life and philosophy. 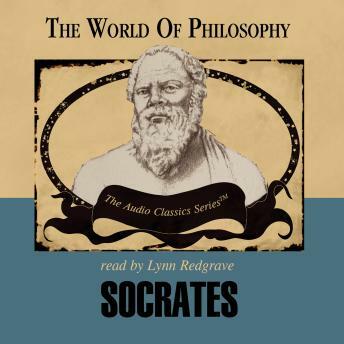 Socrates was an eccentric who went about Athens in bare feet and tattered clothes engaging people in philosophical conversations and exposing the contradictions in their claims of knowledge. Socrates himself never claimed definitive knowledge, but he made enemies among those he refuted and embarrassed with his persistent questioning. While deeply interested in self-knowledge and virtue, Socrates believed that we cannot definitively establish truth or absolute knowledge, that we can only refute wrong thinking. When he was sentenced to death for impiety, Socrates bravely accepted the rule of law rather than lie about his views. His methods have set timeless standards for the relentless pursuit of truth.The World of Philosophy series is a dramatic presentation, in understandable language, of the concerns, questions, interests, and overall outlook of the world's great philosophers and philosophical traditions. Special emphasis on clear and relevant explanations gives you a new arsenal of insights toward living a better life.